Dilworth is Charlotte's oldest neighborhood, established in the 1890's by Edward Dilworth Latta. 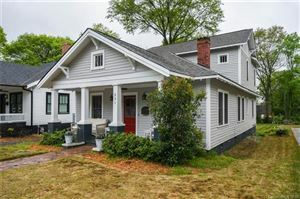 It was originally a streetcar suburb and is now serviced by Charlotte's light rail system. It is a pedestrian community, walkable to Latta Park, Freedom Park and Sedgefield Park and the Greenway Park and many restaurants and shops along East Blvd. Much, but not all, of the neighborhood is in the Dilworth Historic District in the National Register of Historic Places. Just outside of the Center City, Dilworth is bounded by Wilmore and Myers Park and the newer and trendy Southend area.... home to many breweries and art galleries. Charlotte's two major hospitals, Carolinas Medical Center and Novant Health Presbyterian Center, and both nearby. Dilworth is known for it's towering trees and bungalows with front porches. The Dilworth Jubliee and Dilworth Home Tour are popular annual events.